Flanders Precisionaire HD Industrial Grade filters are designed for use in any application where disposable panel filters are recommended. 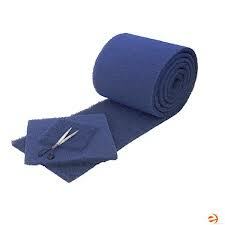 They can be relied upon for superior performance since they are specifically designed for heavy workloads. A wide range of standard face sizes is available, plus nearly any “special” size. EZ Flow and EZ Flow II disposable filters are designed for protection of furnace and central air units in residential and light commercial applications. Construction of both models is identical except for the media retainer. The EZ Flow features a metal media retainer on the downstream side while the EZ Flow II has no media retainer. Instead, the media itself is adhered directly to the frame for non-metallic applications. Originally designed for light commercial and industrial applications, the Flanders precisionaire Modified Channel Frame filter is an excellent choice for use in residential furnace systems. The filter is produced on state-of-the-art production line machinery that compresses a one-piece channel frame onto the media and retainer. The result is a filter of consistent high quality at a competitive price. The Flanders Pinch Frame disposable air filter provides the user with a product of high quality and strength. Originally designed for light commercial and indus- trial applications, the Flanders Pinch Frame filter is an excellent choice for use in residential furnace systems. 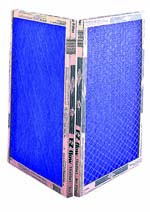 Flanders Ring Panel and Cube filters are made by heat sealing layers of synthetic filtering media together over an interior, corrosion-resistant steel support frame. An overcut of media outside the sealforms a built-in gasket (selvage) between the wire support frame and holding frame, which secures the filter and prevents air bypass. This special feature allows these filters to be installed without the use of retainer fasteners. Permaire is a unique type of air filtration media that has evolved from a natural organic fiber media to a new completely synthetic, self-supporting and completely washable media. It has all the benefits of organic media but has a longer service life, better structural integrity as well as being completely odor free. 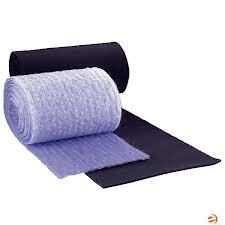 Flanders hammock rolls are available in nominal 1” spun glass, 2” spun glass, and 1” polyester synthetic fiber media. Performance data on all Flanders hammock media is available upon request.